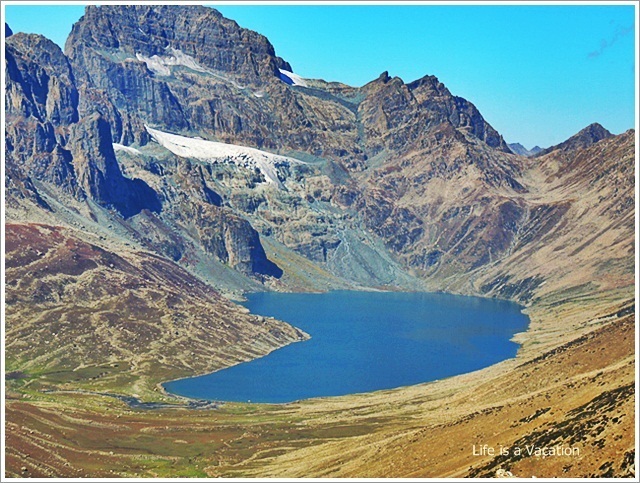 Kashmir Great Lakes Trek is a wonderful way to explore paradise. As you trek from one lake to another through green meadows, birches and pine and sometimes scaling up steep mountain sides, you will surely count your blessings for being granted this opportunity. I went through a myriad of emotions as I walked along and while I would love to do the circuit again, I am reminded that there is so much more to see. Plan for 10 days to do this trip with a sightseeing trip around Srinagar and Sonmarg. This is not for the jay tourist seeking pleasure but for a serious seeker. Day 1: Arrive in Srinagar- Take a evening ride on the Dal, walk around the lake side, indulge in some shopping and rest. Enjoy delicious Kababs while on the shikara. Day3: After a short drive from Sonmarg, the trek starts through Green Meadows. It is an experience by itself to walk through Green Meadows. Day5: The date with the Alpine Lakes have just begun when you walk past Kishansar watching the clouds play hide and seek and then rest near Gadsar staring back at you. Day6: The changing landscape and as you pass by the Satsar string of lakes, crossing over icy streams stir something within. Just when soak in the sun in the middle of the green meadows, the elusive mountain Nanga Parbat makes an appearance across the border. Day 7: A lesson in mindfulness as you cross over rocks and boulders but the path to heaven is not a bed of roses. You arrive at the feet of Harmukh Peak revered in Kashmir Shaivism. If you can brave the cold, take a dip in Gangbal and Nundkol Lake. Day 8: Spend the day at Nundkol and Gangbal watching the clouds go by and the sun circle around the mountains or descend to Sonmarg through Pine Forests. Day 10: Some more of Dal Lake and Srinagar or head out !! This is a moderate trek held between June and September. Plan your exercise schedule 6-8 weeks in advance, working hard on cardio and you will be all set to experience the breathtaking beauty of the lakes. Check out WildBootsAdventure to plan for your Trek. Vikrant the Co-Founder is a wonderful guide. Click on their site to know more on the trek. Is it good time for this trek in July 3rd week? I am worried about monsoon since it would play spoilsport. Definitely has a place on my bucket list.. july 2014!